What if I had never met you? 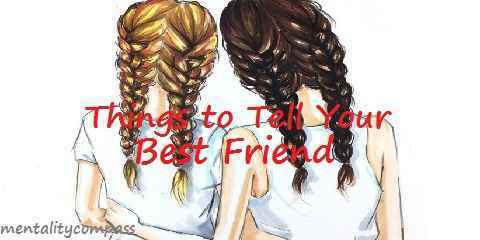 There are loads of things to tell your best friend. It could be your personal crush, your hottest gossip, your honest feeling, your ideal man or woman to marry, your dream, your places to visit, your favorite place to have a cup of coffee, and anything. As your best friend can be your human diary, you can tell your best friend what you want to say just like writing something personal on your diary. Let’s play a truth game. This is when you have to spill and tell the truth without hiding something on it. If you only have one last day with your best friend, what would you tell your best friend? When you and your best friend share each other’s personal story, you might be grateful of your best friend due to his or her presence in your life. Sometimes you might have a quarrel with your best friend but as long as you can maintain that relationship, that won’t be a problem to be afraid of. Every single problem that you have encountered and solved altogether with your best friend can make you feel much grateful. Must Read: How to Avoid Saying I Hate My Boyfriend? During your pray, you need to be thankful to God because you have given and sent your best friend to you. Saying this kind of statement will make your bond in your friendship would be much stronger. You can try to say this statement to your best friend and let’s see what your best friend would give you the response. Have you ever thought this kind of question in your mind? Talking about the impossible thing in life, what would have happened if you hadn’t met your best friend right now? When everybody encounters a matter in life, there must be a step that you have to take. Thus, when it turned out that you had never met with your best friend your life won’t be the same as the way it is. Saying it to your best friend might also make your best friend think the same way. Probably when your best friend hadn’t met you as well, s(he) won’t also be the way as s(he) is. Everybody makes mistakes. Yet it doesn’t mean that other people can simply judge them without understanding the whole story behind it. When your best friend got a problem and it made him/her ruining his/her whole day, you can tell this to your best friend. Although it might be just a sentence, but it means a lot to him/her. You give support to your best friend that it is the essential thing s(he) needs right now. By encouraging him/her, your best friend would be brave and strong to solve the problem and be tough in continuing life. These statements might sound cheesy for other people as they might be unable to convey these sentences. For me personally, these are some of the best things to tell your girl/guy/ex best friend. Next post No Friends in College / High School: What to Do?